One Takoma: Parking or Public Space? "Reclaim your City!" That's the aim of PARK(ing) Day, "an annual worldwide event where artists, designers and citizens transform metered parking spots into temporary public parks." Takoma Park and Montgomery County 2016 observances, on September 16, were small scale, but then turning parking to public use — I'd characterize parking as temporary personal use of public space — is not a new idea. Locally, in Takoma Park, think farmers markets, Fourth of July parade, Street Festival, Grant Avenue Market, and JazzFest, all of which displace cars, actually in those examples from both curb and street spaces. What's different about PARK(ing) Day is that it's a Friday, a weekday rather than a weekend or holiday. That's significant. Our only local weekday closure is Anne Street in Takoma Park, for the weekly Wednesday Crossroads Farmers Market that runs June to November. PARK(ing) Day 2016, Fenton Street, Silver Spring. Photo by Eric Rasch. Fact is that many jurisdictions have an ample supply of commercial district parking, enough to cover weekday and weekend needs. Metered street and lot parking, adding in private lots, ranges from adequate to plentiful in Takoma Park, Silver Spring, Wheaton, Bethesda, and Rockville, the parts of Montgomery County I most often frequent, and the county and city are taking progressive steps to boost transit use, biking, and walking. Further, the growth in Uber and Lyft and the like mean reduced parking demand everywhere, as does the prospect of self-driving cars that would drop you off, park a few blocks away, and fetch you when you're ready to go. We're reclaiming some of that supply for productive uses, for housing, businesses, and recreational space. Urban design consultant Dan Reed described one local project in a 2013 Greater Greater Washington article, "Rebuild of the Blairs will turn Silver Spring parking into parks." Reed reported that redevelopment of the Blairs parcel off East-West Highway, now underway, "would double the amount of housing and triple the amount of commercial... The shopping center, office building, and older apartment buildings would be replaced with acres of new parks, courtyards, and buildings with green roofs." That's 2,800 residential units, 450,000 square feet of commercial space and six permanent parks, according to July Bethesda magazine reporting. I'd love to see revitalization on this scale in Takoma-Langley Crossroads, where large strip malls sit behind acres of surface parking. (Here: a 2013 Urban Land Institute study of the area.) If only we could get Crossroads property owners such as B.F. Saul motivated! A different Silver Spring project is reclaiming an obsolete Montgomery County parking garage, at Colesville Road and Spring Street, for an office building. The county sold the garage to United Therapeutics last year. The new project will include an 11,000-square-foot public plaza and 10,000 square feet of ground-floor retail space, according to Bethesda magazine. In Takoma, how many readers miss the Carroll Street NW surface parking lot that was replaced by Takoma Central and Busboys and Poets? I'll donate $10 to the Action Committee for Transit for each person who contacts me with an honest "I miss it." Takoma Park's most visible current project is redevelopment of the city-owned Takoma Junction parking lot. New construction will yield around 14,000 square feet of ground-level retail space; however, developer Neighborhood Development Company (NDC) is bound only to "use its Best Efforts to create an accessible outdoor space devoted to year-round public use or enjoyment. By contrast, a number of community members had advocated Takoma Junction building less modest than is planned. They would dedicate lot space to community use. PARK(ing) Day writ large? I have to say, the Main Street public-space vision is alluring. Ideas and illustrations presented by community advocate Welmoed Laanstra, at the March 2, 2015 city council meeting opened eyes to creative-reuse possibilities. The city went in a different direction, however, with the thought that doubling-down on retail space, with second-story residential or organizational use, would best serve the community, in the Junction context. The new NDC building would include TPSS Co-op expansion space. Construction will preserve public parking sufficient for the whole of the Takoma Junction commercial district. And even if plans allow only modest outdoor community space, at least we can hope for, and advocate, a deep building set-back from the street with a wide sidewalk, with a garden area that would serve pedestrians and business patrons. I'll offer a different, better Old Takoma community-space candidate. Laurel Avenue (between Eastern and Carroll Avenues) has a light traffic load, wide pedestrian median, and close-by commercial parking lots and metered street parking. We already close the traffic and parking lanes for seven or eight hours each Sunday for the Takoma Park Farmers Market. All it takes to close either traffic side or both are saw horses and signs. Picture something Takoma-scale comparable to the blocks of Broadway in New York, cars banned since 2010, converted to pedestrian public space, and think of Ellsworth Drive in downtown Silver Spring. An extended Takoma Park trial, on a partial, temporary, seasonal, or occasional basis, would cost very little while promising much. I can see immediate uses, for instance for expanded seasonal outdoor restaurant seating for Thai/sushi restaurant Kin Da, currently limited to a few sidewalk tables; as a place to munch your Pizza Mover's take-out or just hang out; and to support the planned Takoma Beverage Company, a cafe that is slated to open in late 2016 or early 2017. Laurel would be an ideal venue for food trucks displaced from the former Trohv location, now home to a Starbucks and the Big Bad Woof. All that's needed is tables and chairs. And the block has potential as a performance and meeting space that the Takoma Junction lot lacks. Laurel Avenue performers and speakers wouldn't be vying with the noise from four lanes of Route 410 traffic that often includes emergency vehicles. Elsewhere in Takoma Junction, on a smaller scale, we could give over a couple of street parking spaces on Grant Avenue to Spring Mill Bread, which the business explored during a few of the Grant Avenue market street closures. Same with Dolci Gelati, if the business wishes, or the Italian restaurant planned by Dolci Gelati's owners for the adjacent Carroll Avenue storefront, and the Black Lion restaurant and Peter's Sub Shop at Maple and Sherman Avenues. Any other suggestions? Nothing permanent, just repurposing à la PARK(ing) Day, but everyday rather than one day. It has been many years since developers, planners, and engineers laid out our streets. Times have changed — transportation choices, public priorities, and our sense how to best use shared community resources — so we revisit streetscape choices made decades ago. We add traffic calming, Bikeshare, bike lanes, and raised crosswalks, and we redevelop and downsize excess parking to create commercial opportunity and new housing and to boost community vitality. Montgomery County efforts have transformed Silver Spring. Takoma Park can also move forward. Progress will take persuasion in Takoma-Langley Crossroads, perseverance in Takoma Junction, vision in Old Takoma, and actually only a small experiment at at Maple and Sherman. "Reclaim your City!" 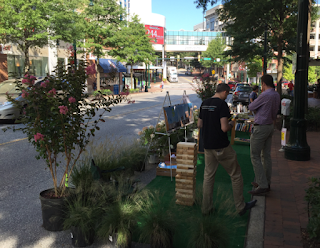 Let's make that PARK(ing) Day mantra ours, every day.